Designworks is proud to be supporting the Tour of Britain’s Stage 2 ‘Cumbria, the Lake District Stage, Carlisle to Kendal’. Stage 2 of the Tour of Britain starts on the morning of Monday 16 September, at 10.45am, in the 2,000 year old city of Carlisle. The route heads out towards the Western Lake District Coast, before returning inland. It traverses some of the most dramatic scenery in the UK, including the iconic Honister Pass, before finally wending its way to finish in the ancient market town of Kendal at approximately 3.30pm. 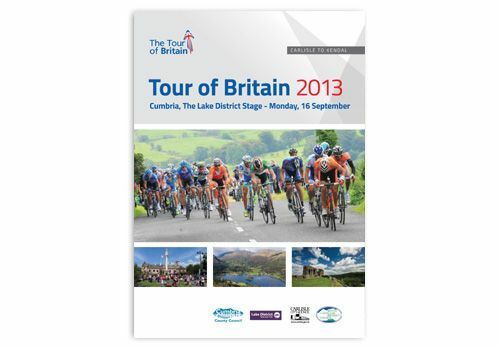 As part of our sponsorship, Designworks designed the Tour of Britain stage guide for ‘Cumbria, the Lake District Stage, Carlisle to Kendal’.